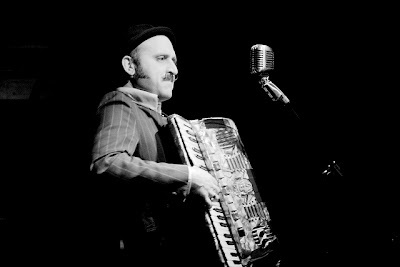 Franz Nicolay (photo by Last Year's Girl) playing between Ben Marwood and Frank Turner, recorded live at PJ Molloys, Dunfermline on 11 May 2011. It’s a muggy July evening, and the audience are overheating in the Wee Red Bar in the bowels of Edinburgh Art College, but hey, the beer’s cheap! What else do you need on a night out to see some local bands? A table of plastic toy animals greets you on entry; it’s quirky, giving the impression that something is going to be different about this band. Waiting for the band to set up, with the rumblings of Primus and other alternative bands from the 90s coming through the PA, the crowd gets in the mood for what promises to be a great set. A promising board of guitar effects are employed and about to be used by a left-handed guitarist sporting a Status-Quo t-shirt?! What the heck is going on? The crowd are beckoned to come closer, come closer.... and we’re off! Straight into 'Fridge Buzz', a straightforward, no-messin’ early 90s punk/grunge assault reminiscent of Nirvana’s Insecticide/Bleach era with a bit of The Vaselines thrown in. Then we’re immediately into 'Shotgun', with its driving drums, and the audience clearly loves it. Things slow down a touch for 'Grey Blood' from the band’s EP A Dark Spring (pictured), released on 1st July 2011. Images of speeding around city centres adorn the back of the stage, adding to the effect. This is a track you can lose yourself in, and the lead singer of Plastic Animals clearly enjoys the instrumental parts of this song; at times it’s clear he’s happily in his own special place with his guitar. Kudos also goes to the drummer and bass player who add some great groove-styled atmospherics. The singer combines vocals with the bass player towards the end, bringing the crowd further into that special place with them. 'Green Light', also from the band’s new EP, continues the chilled-out theme with a slightly progressive feel about it. The build-up to the bridge provides swelling harmonies before repeating “hours, hours and hours”. It would be nice to sit in a spot for hours being transported to the world of the Plastic Animals, it’s a shiny place. Green Light builds towards the end with a driving instrumental supported by an excellent bass line. Next up is 'Gold Medallists', which sees the introduction of a llama head for one audience member. Picture this: an epic sounding melodic trip with someone dancing in a llama head – no drugs required! This is one heck of a melody-based track and definitely a highlight of the set. Plastic Animals are certainly in a league of their own with this track. Superb harmonies inform the crowd, “we keep on falling in the same way.” However, this is a local band in ascendance in Edinburgh and you can’t help but wonder what’s up next for these three not-remotely-plastic animals. Next up is the final track from the EP, 'It Fell Apart'. Again, it’s a slow burner which results in some fantastic use of the guitar board, to end things on a high. Penultimate track 'Maybe Tomorrow' has a build-up reminiscent of 90s Swedish band Kent and their track '747'. 'Maybe Tomorrow' is one of those tracks that will remind you of how you can daydream about your life. It gives the listener hope that something better will come along tomorrow. Final track 'Pirate DVDs' brings with it a treat of guitar effects that are never overused. It can be tricky (and tempting) when you’re a guitarist to go too far with your use of effects. Just because they’re there doesn’t mean you should use them all at once. 'Pirate DVDs' includes a well-balanced use of guitar tomfoolery. This is a track that slows the pace right down and then assaults you with a punk- infused firestorm. Superb atmospheric vocals start to loop towards the end and that llama head is seen swinging continuously. It’s almost like a pagan ritual with a llama in charge and the band providing the ultimate audio sacrifice, but hey, if this is how you’ve got to lose your soul then it’s a pretty awesome way to go! This band are highly recommended, yet another gem in Edinburgh’s music crown. The EP A Dark Spring is available on Bandcamp at a mere £5 for a hard copy, but for that price you also get the digital download so you don’t have to wait for it to hit your letterbox. Their next gig is in Glasgow at Bar Bloc on 10th August. If you’re in Glasgow, get down there and check these guys out.